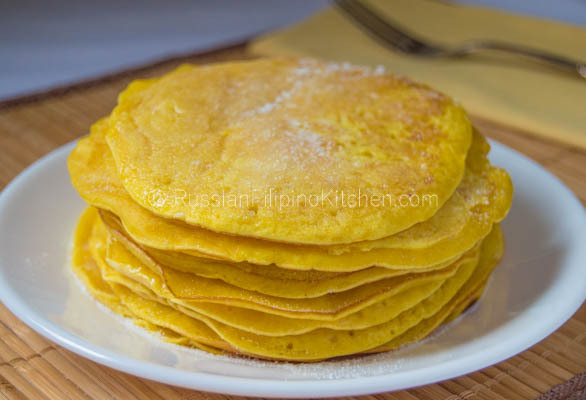 Hotcakes are Filipino version of pancakes, eaten mostly as a snack rather than during breakfast. They’re thin, spongy, and have that signature egg yellow color. Before serving, you slather each hotcake with margarine or butter plus a generous sprinkle of granulated sugar on the top. They are popular street food in the Philippines owing to the fact that they’re very easy to make, delicious, and inexpensive. I often make foods that remind me of my childhood and these yellow hotcakes are one of them. Eat them for breakfast or snack, it doesn’t matter. My whole family loves them. I enjoy hotcakes with a hot cup of coffee in the morning, and hotcakes with iced tea or cold ginger ale as afternoon snack. So here’s the recipe. I hope you love and enjoy them as much as we do! 1. In one medium bowl, mix flour, baking powder, salt, and sugar. 2. Mix milk, egg, and vegetable oil in another mixing bowl. 3. Add wet ingredients to dry ingredients and mix until well-combined. 4. Add the yellow food color and mix into the batter. 5. Lightly oil a skillet with a cooking spray or some butter and adjust heat to medium low. Scoop ¼ cup of the batter and drop onto skillet. Shake to spread it out in the pan. 6. Cook for about 30 seconds or so until sides of hotcake starts to pull out. Use a turner to flip the other side and cook for another 30 seconds. 7. Remove hotcake from skillet. Spread butter or margarine on top and sprinkle with some sugar. 8. Repeat steps 4-6 until batter is used up. In one medium bowl, mix flour, baking powder, salt, and sugar. Mix milk, egg, and vegetable oil in another mixing bowl. Add wet ingredients to dry ingredients and mix until well-combined. Add the yellow food color and mix into the batter. Lightly oil a skillet with a cooking spray or some butter and adjust heat to medium low. Scoop ¼ cup of the batter and drop onto skillet. Shake to spread it out in the pan. Cook for about 30 seconds or so until sides of hotcake starts to pull out. Use a turner to flip the other side and cook for another 30 seconds. Remove hotcake from skillet. Spread butter or margarine on top and sprinkle with some sugar. Repeat steps 4-6 until batter is used up. I made hotcakes using your recipe but it turned out very chewy and it doesn’t taste like the ones sold on the streets. I followed everything and i don’t like how it turned out. Hello kxia! I’m sorry you didn’t like how it turned out. These hotcakes aren’t supposed to be very chewy, rather it’s more spongy and only slightly chewy. Did you spread the batter thinly while in the pan? I’ve been making this recipe for so long I haven’t received any complaints so far from those who tried. Thanks for your feedback. One possibility is you overmixed the pancake batter, developing the gluten leading to a firm and chewy texture. Mia, it is already 1:01 am and I am browsing at your recipes! Haha I looove this hotcake. The ones sold in the mercado! Brings back so many childhood memories! i’m so thankful i found your blog. so helpful i made one earlier and i love it. making more next weekend. Pwede ko ba gamitin kruzteaz pancake mix?,and 2% milk instead yun evaporated milk?thanks..
Hello there! This hotcake recipe is made from scratch so I have no idea if using a boxed pancake mix will yield the same result. I use whole milk in the recipe and not evaporated milk. You can use 2% low-fat milk without problem. I tried it and my husband say “it’s good!”. Thank you very much! Hey Mia, I’m Saudi right now. And as n OFW I get cravings from food back home. This whole month I’ve been having this weird craving of hotcakes and it just won’t go away. So I had to search the web and cae across your blog, I actually saw a vid of this on yutube too, I guess that’s also yours since the photos used and instructions are exactly alike. Can’t wait to end my shift now and try this stuff. Just gotta feed my cravings to make it go away. Haha cheers to you for helping out a fellow kababayan like me! Hello kabayan! I’m glad you found my hotcake recipe. It’s really super easy. Hope you tried it and liked it as much as my family does. My daughter requested me to cook Filipino style hotcake and I used your recipe. Thank you because my girls liked it. It’s so yummy. Thank you. I’m so glad to hear it. Thanks for your feedback :-)!